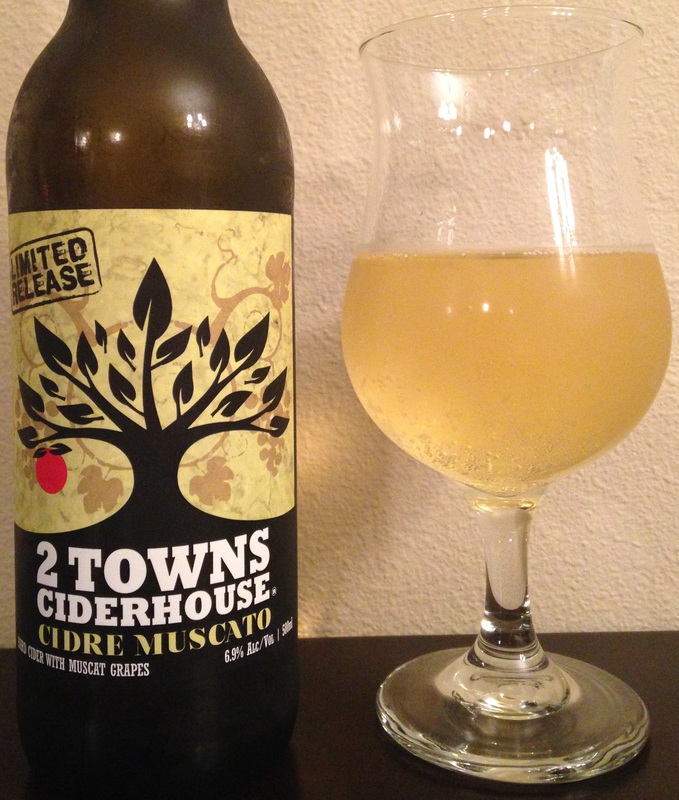 Review of Cidre Moscato from 2 Towns, made using Muscat grapes. I had this awhile back and couldn’t remember if I liked it before, so was curious to try it again when I stumbled upon a bottle in the walk-in cooler of a local grocery store. This was a special release quite awhile ago, so I was surprised to find it. I’ve had at least 10 selections from 2 Towns. Availability: Probably limited at this point as it was a special release in 2014 I think. 2 Towns ciders however are sold in OR, WA, CA, AK, HI, NV (limited), ID, IL (Chicago), & MN (Minneapolis). 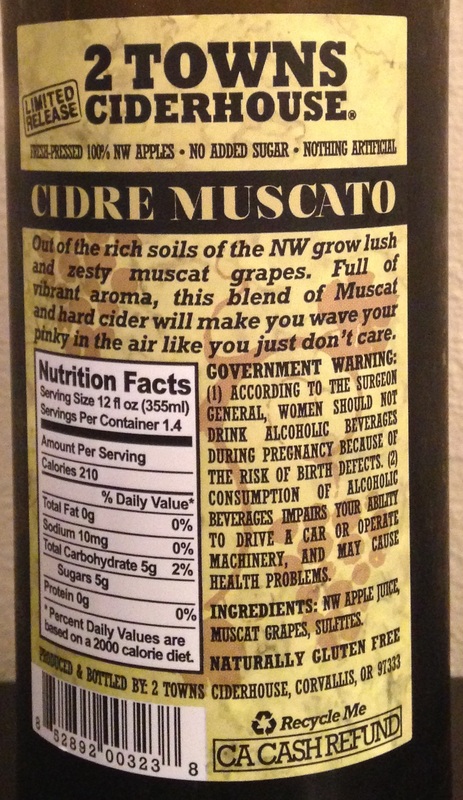 Cider Description: Out of the rich soils of the NW grow lush and zesty muscat grapes. Full of vibrant aroma, this blend of Muscat and hard cider will make you wave your pinky in the air like you just don’t care. 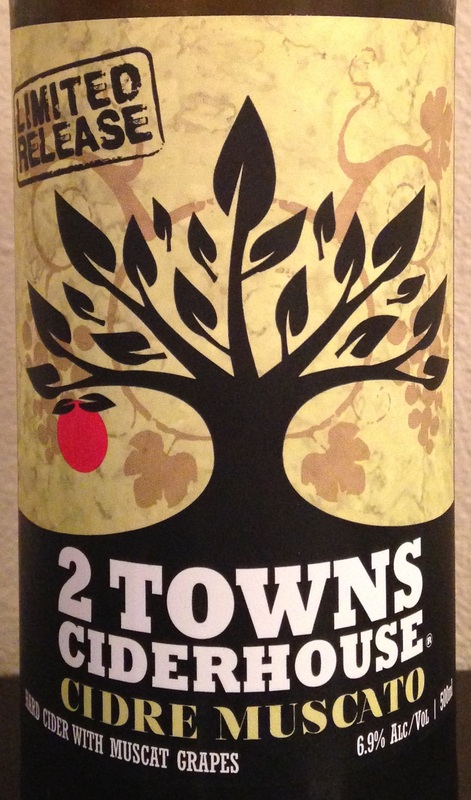 Cidery Description: 2 Towns was founded in 2010 by partners Lee Larsen and Aaron Sarnoff. Dave Takush joined us shortly thereafter. All three of us grew up together in the Corvallis, OR area. We’ve had explosive growth since our inception at which point we had intended to produce and distribute cider to the Corvallis, OR and Eugene, OR areas only (incidentally, the 2 Towns of our namesake). It became readily apparent that our initial vision needed to grow as we hit our maximum capacity in our first production space (a converted 1,000 sq ft garage) in roughly 2 months. We’ve since built 2 new production facilities with a total of 25,000 sq ft of production space and our team has grown to over 30 people to help us to distribute to 9 states and counting. Over this time, we’ve kept to our original goal of bringing craft hard cider back to the people. We feel that a craft cider is made with fresh-pressed fruit and contain no artificial flavorings. Our fruit is all sourced in Oregon & Washington and all of our ciders are also free from added sugars other than those present in the juice and in some cases local honey. We feel that cider doesn’t need to be sweet to express the natural flavors of the fruits we ferment. 2 Towns Ciderhouse planted an orchard in 2011 with all traditional cider apple varieties such as Kingston Black, Dabinett, Jersey Brown Snout, and many others. 2 Towns has also contracted with several growers in the Willamette Valley and beyond to grow additional traditional cider fruit. How Found: Browsing the walk-in fridge. I also found the first bottle awhile back the same way. First Impression: Light carbonation, a few small bubbles. Straw yellow, no haze. Very light tropical and white grape scent. Opinion: Semi-dry. Fruity, refreshing, and light. The tropical and white grape notes continued into the flavor. Higher acidity. Low to moderate tartness. No bitterness. Light astringency. It has some sweet flavor notes without being sweet. The flavor profile on this cider is pretty mild. Very unique. Moderately complex too. Most Similar to: Attila Scourge of God (review here), although that didn’t have the additional fruitiness. Moa Kiwifruit was also on the drier side and had a light tropical kiwi flavor. Most tropically ciders I’ve had were a bit sweeter, such as Reverend Nat’s Revival (review here) and Woodinville Ciderworks Tropical (review here). Closing Notes: Tasty! This would especially be a great summer cider. I was surprised I enjoyed it so much as usually I go for bolder ciders. Have you tried 2 Towns Cidre Muscato? What did you think?